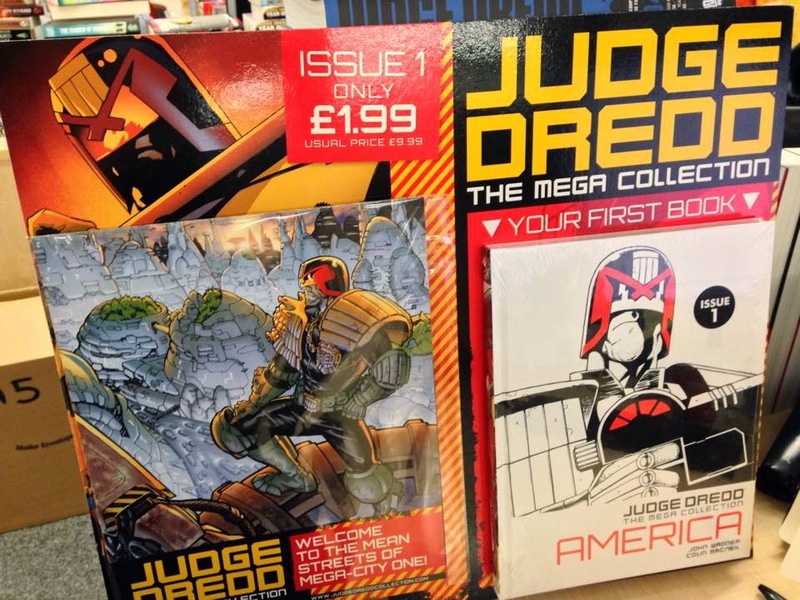 The Judge Dredd Mega collection hits stores this week. 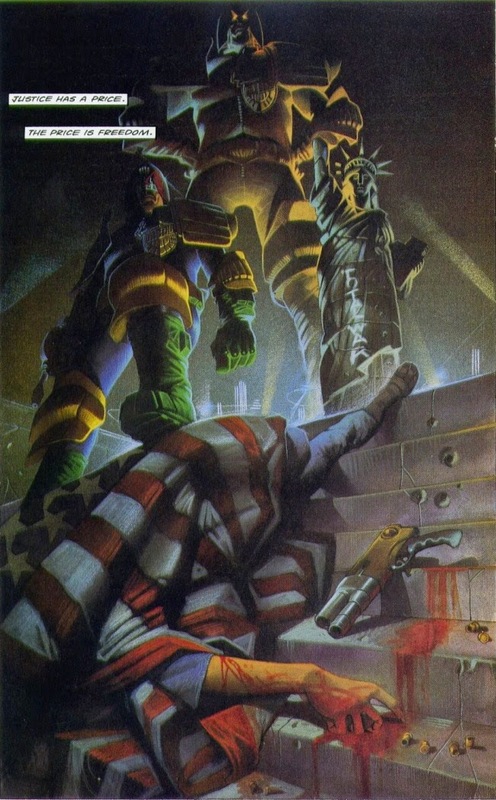 Hatchett are reprinting a collection of definitive Dredd stories in hardback editions, beginning with John Wagner's and Colin MacNeil's America, widely considered to be one of the best Dredd stories ever told. In addition to collating out of print material and stories, these new volumes will include specially commissioned feature content exploring Dredd’s world, interviews with the creators, previously unseen sketches and designs, giving a behind-the-scenes glimpse into the development of classic characters, scenes and storylines. The spines of the books (80 in total, I believe) are each printed with part of an illustration, that when assembled together with all of the volumes produces a complete, new piece of art. I've been venturing further and further into the Dredd-verse and very much liking what I've read there so far. Wagner's and MacNeil's America is a masterpiece, one of those books that you should read regardless of your thoughts or familiarity with Dredd (it reads fine as a standalone). The story of two childhood friends, Bennett Beeny and America Jara who grow up and apart together, America charts how each deals with living in an oppressive system in which they have no choice and power. When the two are eventually bought back together, Beeny is now a successful singer, and America now a member of a terrorist organisation which has the downfall of the Judges in mind. The emotions and frustrations and actions are so acutely captured and realised, while making it's main character- Dredd- as the antagonist is a risky but super effective move. It works on many levels, as political commentary, as a tragedy, as a great story, and remains relevant and fresh today. 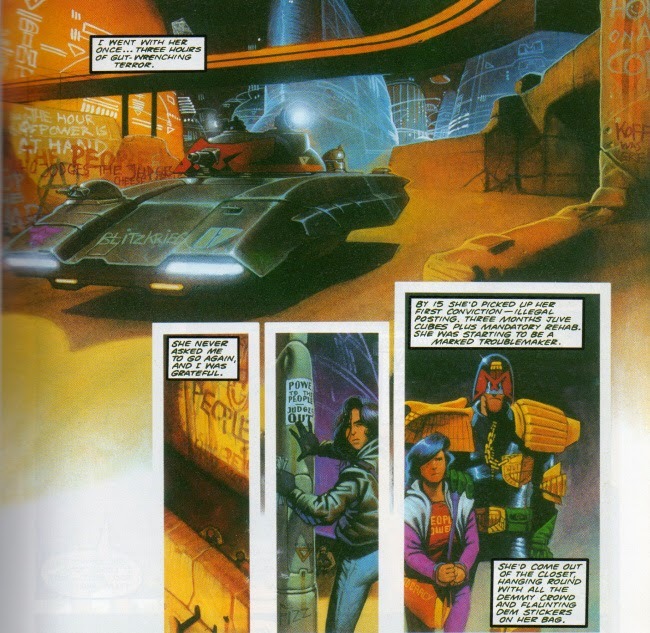 Wagner's a superb writer, but MacNeil's art really elevates things to another level here- take a look at some of the excerpts below to see what I'm talking about. It's a very good choice to kick off this kind of series; accessible and high quality, and will be available in stores this Wednesday, with the first volume, America, priced at £1.99 (for a hardback book). If you've been curious about Dredd or have never read America, or are just looking for a superior reading experience, you'll want to pick this one up. The Mega collection volumes will release fortnightly and are priced at £9.99 each from the third issue onwards. Available in the UK and the Republic of Ireland only. "Available only in the UK"
Can't say no to a nice America hardcover for 3 euros, or whatever 2 pounds is these days. 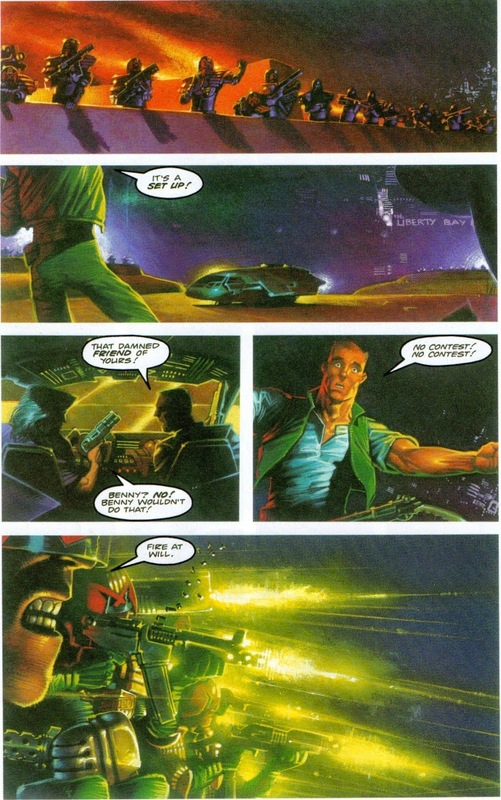 As an American, Judge Dredd America is one of the screwiest comics I've read in regards to my already screwy homeland. Not because of its criticisms, but because the main character gets his newly vegetable-ized friend pregnant without consent, gets his brain transplanted into her body, gives birth to their child, and then has their daughter call him daddy. OOF! So many great sci-fi concepts there. 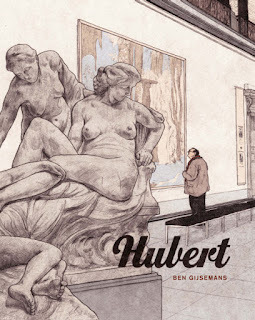 Wonderful comic.